Cytosine residues in DNA that can be methylated (i.e. CpG sites) are likely to be in the same methylation state if they are geographically (proximally) close together. 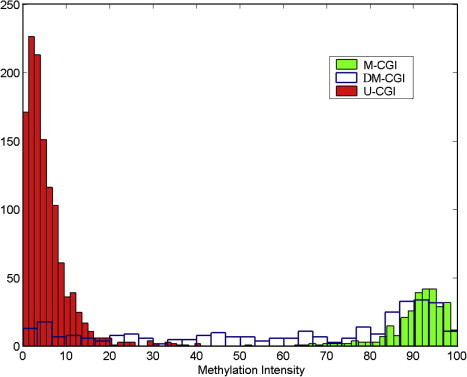 I can only find one paper that states this empirically (1), that 90% of CpG sites within 50bp of one another are in the same methylation state - see below graph. However this study is quite dated now (in the fields of epigenetics at least), and is very general. I would like to know whether CpG's in different regions of the genome are more/less likely to be correlated than in other regions (say, exons vs. promoter regions). It would also be interesting to know whether the correlations change with age, and whether this is related to any disease processes? I've got to dash off so I won't be able to give a fully in-depth answer today, but this basically boils down to the concept of CpG islands. 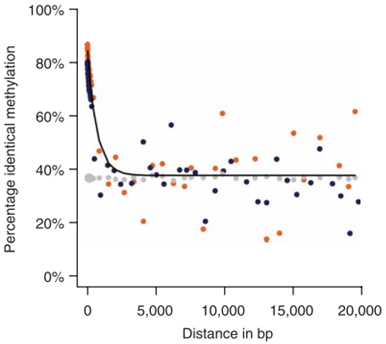 Something like 70-80% of CpGs are methylated in humans, so if they were randomly scattered around the genome there is already a pretty high chance nearby CpGs are in the same state. However, because of CpG islands, CpGs of similar state are indeed grouped together, depending on promoter activity (to simplify things a bit). Basically, it's usually high-methylation or low-methylation; rarely is there anything in between. There's a lot more in there so I'd recommend going through some of them; I'll try to get back to this later. Not the answer you're looking for? Browse other questions tagged human-biology dna human-genome dna-methylation cpg or ask your own question.